Lilacs stand out only in May when they bloom, serving the rest of the year as background foliage. They are often used as screening plants, in freestanding groves or in large shrub borders. Most lilacs grow too tall to use for foundation plantings next to one-story buildings, but they work well as informal screens for old barns and tool sheds. They do fine in sites exposed to wind and strong sun and on slopes or hillsides where many other shrubs will not thrive. 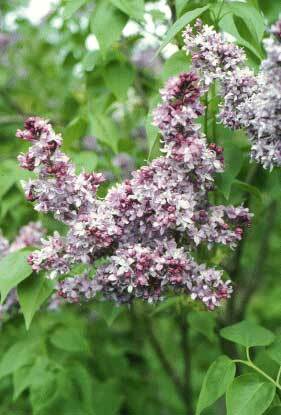 Incorporate dwarf lilacs into a flower or small shrub border. When grouping lilacs, do not plant them closer than 6 feet apart. Mature, tall, dense lilacs offer good nesting sites for some birds. Their richly colored trumpet shaped clusters of florets, attract hummingbirds in search of nectar. While it would seem that lilac blooms are perfect for butterflies, they bloom too early in the season in many parts of the country to be available to adult butterflies, although they support some types of butterfly larvae (caterpillars). Butterflies need heat to survive, so they do not make an appearance in backyards until summer is underway. In many northern regions, lilac bloom season has passed by then. An exception to this is the littleleaf lilac (Syringa microphylla) that, while it booms initially in May, may show a second flush of its fragrant light pink flowers later in the summer. Monarch butterflies visit lilacs that are in bloom for nectar, as do tiger swallowtails. Lilac flowers can be forced indoors prior to their outdoor bloom time as early as October. Most commonly homeowners cut branches with buds in February or early March. Pick a relatively mild day. Put stems in a pail of warm water immediately for a few hours so they can absorb as much moisture as possible. Then transfer them to a cool, light (no direct sun) room for several weeks. Keep an eye on the water, change it twice a week or so to keep it fresh. It will take from 4 to 6 weeks for the buds to begin to open. When the buds swell enough that you can see their color, bring the branches into a warmer room and arrange in a vase for display. Lilac blooms make wonderfully fragrant bouquets. Cut the blooms in the morning when they are just barely opening, plunge the stems immediately into a bucket of warm water (about 110°F. is fine) and bring them indoors. Slit the stem ends to encourage water uptake, strip any leaves from the stems that might foul the water, and add a commercial floral preservative or half a can of citrus based (non-diet) soda to an equal amount of water in their vase to prolong freshness. Display them alone, or in combination with tulips and other spring bulbs.